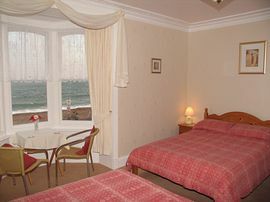 The Channel View B&B is located in a terrace overlooking the beautiful "Weymouth Bay", 15 metres from the beach. We are within five minutes walking distance from the town centre, bus and train stations. Places of interst nearby include, Monkey World, Bovington Tank Museum, Abbotsbury and Portland. We are ideally placed for those who like walking, birdwatching and water sports, or just relaxing on the beach. Our dining room is light and airy, looking out to sea. Breakfast consists of a selection of juices, cereals and fruit, traditional English fayre, toast and preserves; freshly made tea and coffee. There is a comfortable lounge, or just sit on the patio and watch the world go by. Car Parking overnight is permissible on the road, from 1st June to 30th September and all day from 1st October to 31st May. Special Diets Provision: Special diets are catered for. Vegetarian breakfast available. By Car: We are located at the junction of the A353 and A354 in Weymouth. October - March from: £28.00 to £32.00 per person per night. April - June and September from: £30.00 to £34.00 per person per night. July - August from: £32.00 to £36.00.